For more than 80 years the lovable Popeye the Sailor has been entertaining us with his funny accent and love of spinach. His adventures with Brutus and romantic times with Olive Oyl and Sweet Pea make us laugh and warm our hearts. Popeye is a one-of-a-kind character that will forever be a part of American culture and history. Popeye was created by E.C. (Elzie) Segar, and first appeared as a guest character on January 17, 1929 in “Thimble Theatre,” a daily King Features comic strip. The strip featured the character Olive Oyl, her brother, father, and boyfriend Ham Gravy. By popular demand, Popeye continued to make appearances in this strip and in 1931 the name was changed to “Thimble Theatre… Starring Popeye”. Eventually the popular comic strip name was changed to “Popeye”, and daily segments ran in newspapers across the US. The strip continues to run in many papers, with new adventures appearing every Sunday. Popeye was an ordinary man, but when he ate spinach, he turned into one with extraordinary strength. It is believed this contributed to increased spinach consumption in the 1930s. A more recent study reported that kids increased vegetable consumption after watching Popeye cartoons. 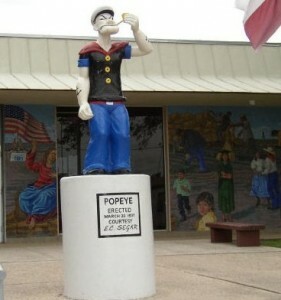 While there are disputes, spinach-growing communities have erected statues of Popeye in recognition of his positive effects on the industry. These include Crystal City, TX (which calls itself the Spinach Capital of the World), Springdale, AR and Alma AR (where Allen Canning markets the Popeye brand of canned spinach). Another statue resides in Segar’s hometown of Chester, IL. In 1933, Paramount Pictures had “Thimble Theatre” adapted into a series of animated cartoon shorts and named them Popeye the Sailor. Popeye’s first film appearance was actually in a Betty Boop short. He was shown dancing the hula with Betty, and singing his famous song, “I’m Popeye the Sailor Man”. It is in the film shorts that we first see the correlation between Popeye’s strength and spinach, and these shorts catapulted Popeye into superstardom. Americans loved the funny little man, and children could join the Popeye Club and receive a membership card and a kazzoo as they watched the Saturday matinee at the movie theater. With Popeye’s increased popularity came merchandise, like toys, books and games. Many licensed items continue to be produced, as well as new types of merchandise introduced to the buying public. By the mid-1930s Popeye was a household name, also due to his debut on NBC radio on September 10, 1935. The “Popeye the Sailor” show ran – changing to CBS in August 1936 – through July 29, 1938. In the 1950s, Popeye hit American households, as the theatrical short films were sold to television. Originally in black and white, the cartoons were soon changed to color. 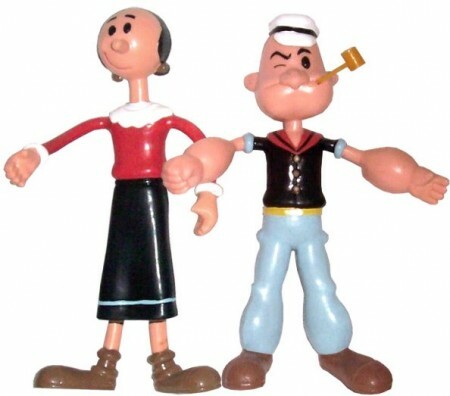 In the 1970s a new batch of Popeye cartoons were created, appearing in the Saturday morning line-up. These popular shows were later available on VHS and DVD. Wot ain’t on the up and square. But none of ’em gets nowhere. Did you watch, read, or listen to Popeye as a kid? Share your memories below.